The picturesque small city in north-eastern France is testament to the destruction and havoc that a war wreaks upon the world. It is the microcosm of reality. “Only the dead have seen the end of war”. So proclaimed Pluto. And these words echo in one’s ears while going through the history of Verdun. The picturesque small city in north-eastern France is testament to the destruction and havoc that a war wreaks upon the world. It is the microcosm of the realities of war and the cruelty that man brings upon the world if he sets his mind to do so. The vast area around the French city of Verdun remained suspended in the year 1916. During the First World War, these hills and gorges were cratered by a continuous ten-month-long artillery bombardment more intense than any before and any since. The mature beech forests that cover the hills were home to some of the Great War’s most bitter fighting; as many as 150 shells fell for every square meter of this battlefield. The zone rouge (English: red zone) is a chain of non-contiguous areas throughout north-eastern France that the French government isolated after the First World War. The land, which originally covered more than 1,200 square kilometres (460 sq. mi), was deemed to be too physically and environmentally damaged by the conflict for human habitation. Restrictions within the zone rouge still exist today although the control areas have been greatly reduced. British, French, American, and German armies fired approximately 720 million shells and mortar bombs on the Western Front between 1914 and 1918. Military experts estimate that as many as one in five rounds of ammunition fired by either side failed to explode. 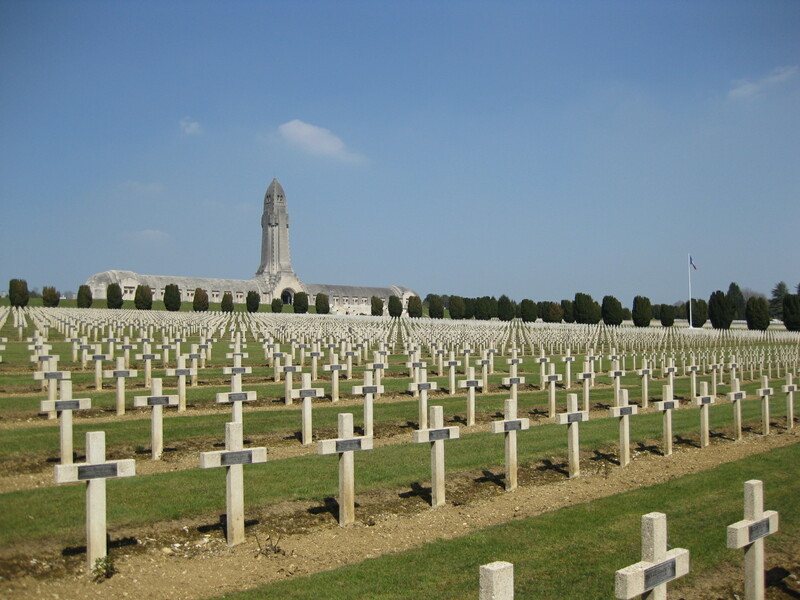 As a direct result of land contamination by unexploded ordinance, 16 million acres of France were cordoned at the end of 1918, including the 2 million acres around Verdun. The French government actually formed a special agency dedicated entirely to the ongoing munitions clearing, called the Department du Deminage. The French Interior Ministry estimates that at least 12 million unexploded shells reside in the hills and forests that rise above Verdun. At the current rate of clearance it is a conservative estimate that the Department du Déminage will still be finding these weapons nine hundred years from now. Meanwhile, teetering on the edges of the Zone Rouge on north-eastern France, surrounding villages, to compensate for all the quarantined land they can’t and probably never will be able to farm or ever set foot on, locals take advantage of the region’s military history. In Pozières, one of the villages that was completely destroyed in World War I and subsequently rebuilt, there is a café and restaurant called “Le Tommy”, dedicated to the sacrifice of the allied forces, which has reconstructed a WWI trench in its back garden for tourists.